In wake of the violence in Charlottesville, Virginia, one North Carolina woman was inspired to speak out against someone flying a Nazi flag she saw in Mount Holly in Gaston County. Page Braswell told The News & Observer that she couldn’t remain silent after seeing the violence in Virginia. She didn’t know Joe Love, the man flying the flag. Still, she pulled into his driveway on Sunday ready for a confrontation. “I thought, ‘What? This is my town,’” she said in a video that has since gone viral. In the video, Braswell shows the flag as well as a sticker supporting Donald Trump on the man’s truck. “Hey! What’s up with the Nazi flag?” she’s heard asking. Braswell actually identifies as a straight, white married woman and doesn’t actually fly a rainbow flag, though she said that she would like one. His language was a shock to her, though she understands it is a typical thing members of the LGBT community hear all the time. Braswell volunteers at the Charlotte women’s clinic, so angry protesters are not a new experience. She said that if the two had a civil conversation she might not have posted the video featuring the man’s name, address and family business. Instead, he attacked her and called her names. 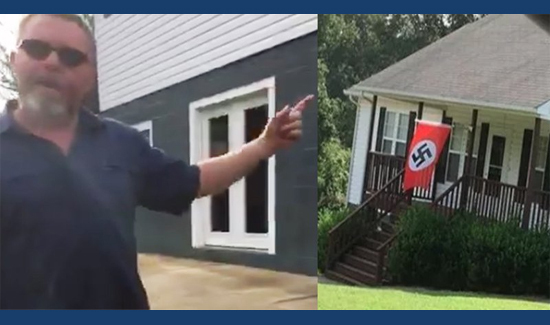 In an interview with the Gaston Gazette, Love said that he only hung the Nazi flag because his three previous Confederate flags had been stolen. The man did not clarify if he was a practicing Buddhist or a Hindu, however. Instead, he said he’d take it down and put up another Confederate flag. Braswell said that the Confederate flag is “still horrible” but she probably wouldn’t have reacted so strongly because there are so many in her county. Over the weekend, many encouraged conversations or confrontations against Nazis or white supremacists, but urged caution given the many reports of violence at the hands of the groups. “Not everyone will be able to confront racism, but here’s the thing: We white people caused this mess, and it’s our mess to clean up,” Braswell said on Facebook. She is willing to take the risk, however.